Meaning is the ultimate goal, not happiness. Meaning is the ultimate goal, not happiness! Life, liberty and the pursuit of happiness. 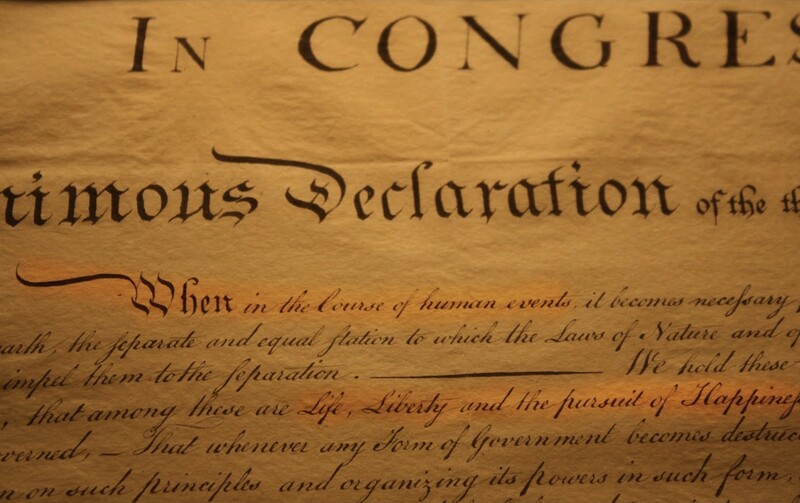 Most Americans are familiar with these words even if they don’t know that they are contained in the introduction to the Declaration of Independence, the statement announcing that, in 1776, the 13 American colonies were now independent and no longer under British rule. The full phrase contains the following words: “We hold these truths to be self-evident, that all men are created equal, that they are endowed by their Creator with certain unalienable Rights, that among these are Life, Liberty and the pursuit of Happiness.” These powerful words and the concepts behind them helped to establish a platform for democracy in the United States of America and elsewhere in the world. Unfortunately though, the concept of happiness has evolved since 1776 when this phrase was first introduced. Now, we often relate the thought of happiness with living “the good life,” a concept that has been hijacked by advertisers and portrayed as a life in which we seek pleasure, relaxation, and, of course, material goods. Society has told us that we can achieve happiness through consumption. Society has made us think that: if only…if only I had a bigger house, a better car, more money, and a better job, I would be fulfilled. But more choices and more personal freedom have led to higher expectations, which, in turn, have led to never being satisfied with what we have! We think we want more, but when we get it, it is not enough. We still want more. “Enough” becomes a moving target. And we spend so much time working to pay for things we don’t really want, let alone need. In the pursuit of the “if only,” we have sacrificed our relationships, our health, and our sanity. We’ve also been taught that we should expect to have it all and we should expect to have it NOW. In other words, we are driven by instant gratification — and justify it with thoughts like, “just put it on credit,” “there’s no need to earn the money today,” “pay for it later.” Not just individuals but cities, states, and nations have embraced this belief as well. Even the relentless pursuit of pleasure and power has shown itself to be short-lived because pleasure and power are founded on the same “if only I had more” logic. Left unchecked, these forces comprise a vicious cycle and manifest themselves as an endless — and joyless — undertaking much like that experienced by the Greek hero Sisyphus, who was ordered by the gods to push a big rock uphill only to see it slip out of his hands in the very last moment and roll down the hill once more. Perhaps the founders involved in the drafting of the Declaration of Independence had this deeper concept in mind when they wrote the words, Life, Liberty and the Pursuit of Happiness. We hazard a guess that they weren’t referring to what we refer to as Hedonistic Happiness, a fleeting emotion and moving target, dictated by things, events, or other people, all external to ourselves. We believe they were referring to the deeper concept of meaning as the ultimate purpose or end goal of our life. The meaningful life, in the final analysis, is measured most dramatically on our deathbed. We will feel fulfilled if we do not harbor serious regrets or misgivings about our unrealized or unfulfilled potential. We will feel fulfilled if, upon reflection, we feel that we expressed who we truly are, and importantly, created a life we really wanted to live. To our very last breath, we must realize that life is a journey, an odyssey, where meaning, not happiness, is our primary motivation for living. Micro-step: Begin today to discover what really gives you deeper and more long-lasting meaning in your life and focus on pursuing this existential aim, instead of keeping busy with short-term “happy” events or things. Meaning First! Dr. Alex Pattakos and Elaine Dundon are co-authors of two international best-selling books on Meaning, Prisoners of Our Thoughts: Viktor Frankl’s Principles for Discovering Meaning in Life and Work and The OPA! Way: Finding Joy & Meaning in Everyday Life & Work, as well as are co-founders of the Global Meaning Institute and co-creators of MEANINGology, the study and practice of meaning in life, work, and society. Alex Pattakos, Ph.D., aka "Dr. Meaning," is a Founder of the Global Meaning Institute. His unique background bridges political science, public policy, and innovation management, along with existential philosophy, psychology, and meaning. Wanting to change the system and assist in broader societal transformation, Alex received his Ph.D. in Political Science and became a full-time professor of public and business administration, including graduate program head. In addition to preparing students to become the new vanguard -- leaders more aware of the greater need for Meaning throughout society -- Alex also served as an advisor to governments to affect policy change, including service to the White House under three U.S. presidents and to the commissioner of the U.S. Food and Drug Administration. A prolific author, he has written two international bestselling books on the human quest for Meaning, "The OPA! Way," inspired by Greek philosophy, mythology, and culture, and "Prisoners of Our Thoughts," written at the personal urging of the world-renowned psychiatrist, Dr. Viktor Frankl (author of the classic bestseller, "Man's Search for Meaning"). Now, Alex has founded the Global Meaning Institute "to help people discover new meaning in their lives and work, and at a systems level, connect to the deeper meaning in organizations, communities, and societies." He continues to spread the inspirational message of Meaning around the world through his keynote speaking, teaching, writing, and advising/consulting. Most recently, he was named an Honorary Professor at the Moscow Institute of Psychoanalysis (http://inpsycho.ru/), in Moscow, Russia.